It was the wish of the late Marilyn Lewis, wife of Rev. Graham Lewis, back in 2013, that St Peter’s should have a special service to honour the war dead 1914-1919 as named on the memorial plaque in the church, on the centenary date 4 August 2014, and she outlined then how she wished it to proceed. People, including Sgt Boyce and three young members of the Army Cadet Corps of Drums, Maidstone, namely L/Cpl Jarvis, and Cadets Cook and Coster started assembling outside the village school before 9.45 pm. Ann Keeble had prepared about 50 candles in jam jars to hand out to everyone. The candle-lit procession then set off up the lane at 10.15pm. The procession was led by Reader Colin Brown holding the cross, followed by Reader Frances Barnes, who was to lead the service, accompanied by Rev. Phil Barnes. Sgt Boyce and his cadets followed on, beating their drums. The crowd that followed, we learned later, numbered about 140 . Hazel Scott and her team had decorated the church beautifully with poppies and candles. As people arrived at the church they left their candles on the church wall outside. It was amazing to see the people crowding into the church, welcomed by Wendy Keast, church warden and others, and which gradually filled to capacity. Many extra seats had to be found and when there was no more room at the back people filled the choir stalls at the front, the adjoining chapel, and even sat on the altar step! A very moving service began with the opening hymn, “O God our help in ages past”, and closed with “Abide with me”. Frances later said “What an amazing experience, and an honour to have led it. The music and the singing nearly had the roof off, and you could have heard a pin drop as the names were read out. I think it’s the most amazing thing I’ve ever done”. Frances agreed to also read out an extra three names of men whose stories came to light during research into the memorial plaque. All three had been resident in Bredhurst, but their deaths were subsequently recorded on war memorials in different locations. Suresh Khanna, as Deputy Lord Lieutenant of Kent, was the first to lay a wreath on behalf of the people of Kent. 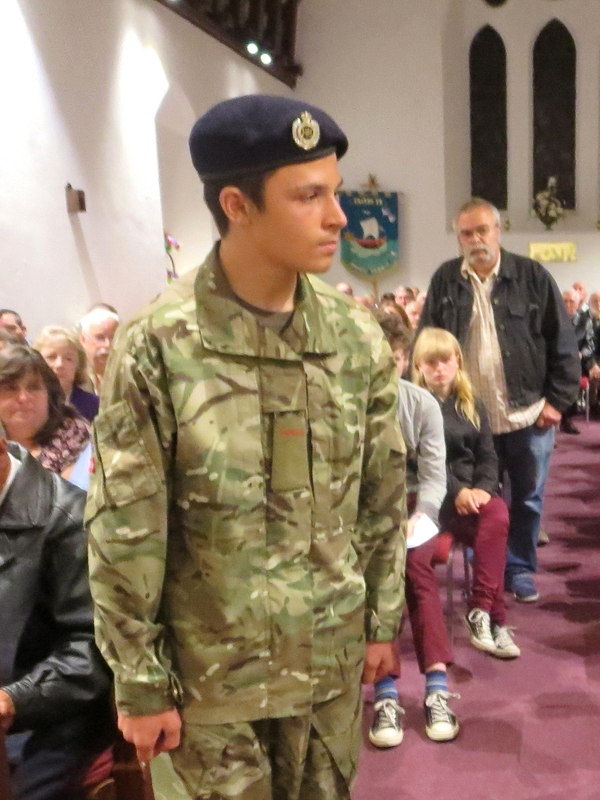 One of the cadets accompanied him to the altar and saluted. Then Reg Johnson, a relative of the two Johnson brothers, Charles and Edmund, named on the plaque, laid his wreath, also accompanied by a cadet. Last to lay his was John Brooks, a relative of Frederick Brooks, one of the five named who gave his life. These elderly gentlemen played a very dignified role in the service, and helped personalise the names that were read out. Just after 11 pm all the lights in the church were extinguished followed by one minute's silence. We hope Marilyn would have been pleased to see so many people taking up the invitation to join in this uplifting occasion, and realising her wish. After the service many who had attended moved on to The Bell, which had kindly agreed to the use of their car park, and extended their opening hours till midnight to accommodate those who wanted to socialise afterwards.